NF Railway Employees Union on Thursday came down heavily on the BJP government at the centre and threatened to take up agitational programmes in the coming days if government fails to fulfill its promises. 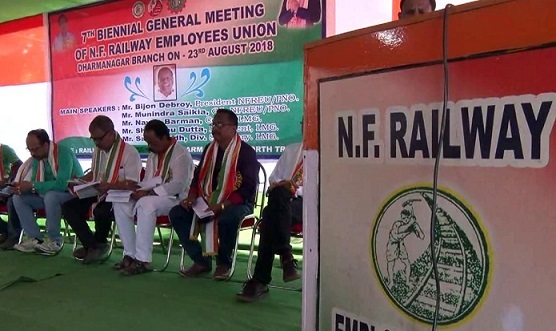 The union leaders aired their grievances at the 7th Biennial general meeting of NF Railway Employees Union, Dharmanagar branch which was held on Thursday near Dharmanagar railway station. Addressing the programme, the union leaders said the BJP government’s promises are limited to ‘words’ only and not work. “After BJP came to power, the railway has witnessed no development ” the leaders alleged. They also pointed out that shortage of manpower hit the railway. The existing workforce is doing over time but not getting paid for it. The workers are even unable to take leave. Bijon Debroy, president NFREU/PNO, Munindra Saikia general secretary NFREU/PNO, Nayan Barman convenor LMG, Shantanu Datta president LMG, Samir Lodh, divisional secretary LMG and other officebearers were present in the programme.